Collecting sweepers remove and collect sand, garbage, and other loose material with maximal efficiency and speed. Carefully planned, reliable technology and stylish design prove their value in practice. Environmentalawareness as well as effective mineral dust and stone powder removal minimize the health risks of the road users. Collecting sweepers are very versatile. Depending on their size and model, you can use them with urban area maintenance equipment as well as tractors and wheel loaders. They are ideally suited for urban, residential, and industrial areas as well as harbours, parking lots, and recycling areas. The particle lamellas, placed on the back and the sides of the unit, efficiently prevent dust from flying around. Adjustable main and side brushes ensure clean and highly efficient sweeping result. The main brush operation is floating and linear. This optimizes the distance between the main brush and the collector, thus ensuring effective collecting. The powerful sprinkler system is lead from the integrated water tank to the anti-corrosion frame. It binds the swept material and prevents dust from spreading all over. LM Tools spinner spreaders make your road maintenance equipment more effective and versatile. They are ideal for antiskid treatment in public areas. You can adjust the spreading amount precisely, which saves the antiskid material and enables you to treat much larger areas. You can use the LM Tools spinner spreaders with all maintenance machines and vehicles whose frame structure is rigid enough to take theweight of the spreader and that are powerful enough to carry the load. You can easily adjust the precise spreading amount and spreading width with the electronic joystick while driving. 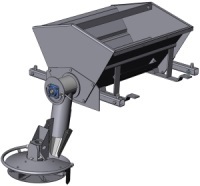 The screw conveyor moves the material accurately from the spinner onto the road. The spinner’s throwing wings are run by a reliable hydraulic motor. They move the material to the specific target precisely according to the specified amount and width. This ensures the desired outcome quickly and in a controlled fashion. LM Tools self loading spreaders makes your tool carrier even more profitable. 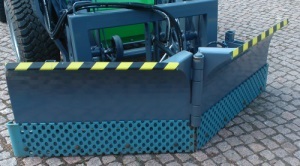 Spreaders can be mounted on the front connection or on the rear connection whereby a bucket or a plough can be on the front at the same time. So you can use the plough and the sandspreader at same run which saves a lot of time = moneyLM Tools self loading spreader is a self loading type as the name says. Spreader can be lowered and tilted so that you can fill the bucket only by driving the machine backwards on a sandpile. Lifting up and speader is ready for the job. Sand spreading function can be switched ON and OFF from the cabin by which you can achieve a very accurate job result and material usage is minimal. Spreading volume can be also adjusted. Working width is by model (bucket size). Crusher axle and safety net are extras. LM Tools leaf collector for a powerfull autumn cleaning. Suitable for a tarmac surface and grass-grown areas. No more need to transport wood residue out of the park areas. With LM Chipper the wood can be chipped at the site, and then used in many ways such as decorating or for fuel in a suitable kettle. Attaches directly into most buckets with a supplied bracket. The Chipper can also be detached easily, to use the bucket in other purposes. The Chipper is also suitable for tractors and wheel loaders with motor hydraulic connectors. The blade drags the wood into the chipper, so the construction can be lighter because no additional input device is needed. A separate sharpening tool is provided with the Chipper, which makes the sharpening easy. LM Tools Rotary mower for maintaining green areas. Great tool for LM Trac 286 & 387 machines.